Kim So’ng-ae is the widow of the late DPRK President, Kim Il-so’ng (KIS), mother of three of his children and step-mother of Kim Cho’ng-il and Kim Kyo’ng-hu’i. She is Kim Il-so’ng second, or third, wife. She was politically active as the country’s first lady, chair of the Korean Democratic Women’s Union and member of the Party Central Committee (CC KWP) and Supreme People’s Assembly (SPA). 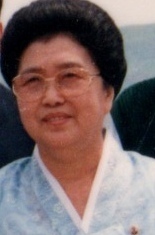 During the 1970s she was one of Kim Cho’ng-il’s main political rivals. Kim So’ng-ae was born Kim So’ng-p’al in 1924 in Sunan County, South P’yo’ngan Province. She was working as a clerical secretary in the former Ministry of National Defense in 1948 when she first met KIS. She became one of the secretaries at his official residence where she worked both for KIS and his wife at that time, Kim Cho’ng-suk (Kim Cho’ng-il’s mother). When Kim Cho’ng-suk passed away in September 1949, Kim So’ng-ae assumed the role of managing Kim Il-so’ng household and domestic life. There are no accounts of any wedding ceremony between Kim So’ng-ae and KIS and she was not publicly introduced as KIS’ wife and DPRK First Lady until the 1960s. In 1951 or 1952 Kim So’ng-ae gave birth to a daughter, Kim Kyo’ng-chin. During the Fatherland Liberation (Korean) War, Kim Il-so’ng’s family members left the DPRK for China, at various times. Kim Cho’ng-il and Kim Kyo’ng-hu’i left Pyongang, first for Chagang Province, then Jilin, China. Either during the war or after its armistice, they learned that Kim So’ng-ae had become their step-mother. In 1953 or 1954, Kim So’ng-ae gave birth to son, Kim P’yo’ng-il. In 1955 she gave birth to a second son, Kim Yo’ng-il. Relations between Kim So’ng-ae and her step-children were tense. Some accounts claim that she did not feed her step-children or that she fed her step-children rotten food. Kim Kyo’ng-hu’i pointedly refused to call her “mother” and Kim Cho’ng-il felt his step-mother did not demonstrate sufficient deference to him. In the 1960s Kim So’ng-ae was introduced as Kim Il-so’ng’s wife and she undertook the role of the DPRK’s first lady, meeting the wives of visiting heads of state and conducting her own domestic tours (e.g. guidance and inspection). She was appointed Vice Chair of the Korean Democratic Women’s Union (KDWU) around 1965. In 1969 she was promoted to Chair of the KDWU. At the 5th Party Congress held during 2—13 November 1970, Kim So’ng-ae was elected a member of the Party Central Committee. She was formally appointed chair of the KDWU during its 4th congress in October 1971. In 1972 she was elected for the first time as a deputy (delegate) to the 5th Supreme People’s Assembly, where was also a member of the Presidium (Standing Committee). Her profile as first lady increased during the 1970s as she regularly appeared in DPRK press and media greeting foreign guests and conducting public work (i.e., visits, media appearances) as KDWU Chairwoman. She traveled as first lady with KIS during his May 1975 visits to Algeria, Bulgaria, Mauritania, Romania and the former Yugoslavia. Kim So’ng-ae’s increasing visibility in the 1970s allowed her to expand her patronage network and her political power. To protect her power and position, she was regularly involved in disputes with key rivals, the partisan veterans, and her step-son, Kim Cho’ng-il. Kim So’ng-ae pursued the hereditary succession claims of her son, Kim P’yo’ng-il and as the president’s son, he formed a small patronage network. By the end of the 1970s Kim So’ng-ae was neutralized by her belligerents. Her patronage network disintegrated. Kim P’yo’ng-il was accused of violating the monolithic ideological system and virtually exiled from the country. Although she was re-elected a member of the Party Central Committee at the 6th Party Congress in October 1980, she was little more than a figurehead as first lady and KDWU Chair. 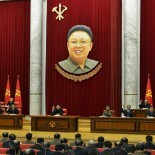 Images and stories of her individual activities were largely censored in DPRK media after 1977. As Kim Cho’ng-il’s political power intensified in the 1980s Kim So’ng-ae’s public profile diminished. She was elected for the last time as a deputy to the 9th Supreme People’s Assembly in 1990 and was a member of its Presidium. She appeared with Kim Il-so’ng when the latter met former US President Jimmy Carter during his two-day visit to the country in June 1994. According to some sources she advocated for the repatriation of the remains of US service members killed in action during the Fatherland Liberation (Korean) War. When Kim Il-so’ng passed away in July 1994 she was listed #103 on his funeral committee. During a memorial service, her name was called between the regular members and alternate (candidate) members of the CC KWP Political Bureau. She was also listed #114 on the funeral committee of O Chin-u in February 1995. According to some accounts, after KIS’ demise, Kim So’ng-ae was placed under house arrest in the isolated Chamo Mountain House outside of P’yo’ngso’ng, South P’yo’ngan Province. In April 1998 she was removed as KDWU Chair and she was not elected a deputy to the 10th SPA, which formalized Kim Cho’ng-il’s succession. In 2000 her son Kim Yo’ng-il died from cirrhosis of the liver. Neither Kim So’ng-ae’s name nor her image have appeared in DPRK media since 1998, although she appears in some documentary films about KIS. Her name also did not appear on the list of Party Central Committee members publicized at the 3rd Party Conference on 28 September 2010, indicating her removal from this position as well.